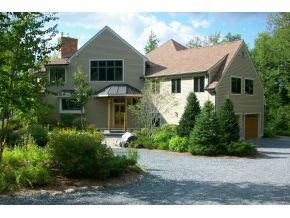 Spectacular 14 room waterfront home with 200' water-frontage on Little Lake Sunapee. Situated on 2+ private acres. Lovely neighborhood of waterfront homes located close to center of town. Enjoy the water views from almost every room. House was completely rebuilt in 2000 by a well known local builder. All the interior trim and doors are custom made red birch. Kitchen has custom red birch cabinets and top quality appliances. There are 4 bedrooms including master suite with private bath. Very spacious rooms overlooking the waterfront. 3 floors of living space providing plenty of sunlight, water views and fabulous sunsets. Eco friendly landscaping requires minimal care with beautiful hardscape stone paths, stone walls and patio. Beautiful sunsets and broad lake views across to Twin Lake Villa & golf course. Golf, fish, bike, hike, sail, boat in the summer and ski, snowmobile in the winter all within minutes of your vacation retreat. Listed by New London Agency Sotheby's Int. Realty. For additional information on this home call Lady of the Lake Realty at 1-888-737-5550 or e-mail at info@nhlakesrealty.com or visit our website to view similar lake homes in New Hampshire www.lakeorskirealestate.com. Contact us today to see if this home is still available? ?